Yeah, the title is not lying. I decided to organize my recipes in a very time-intensive way and it was a lot of work. Normally I’m all about quick and efficient, simple and easy, BUT sometimes I am not. I guess organizing my recipes is just one of those things I get a little uptight about. The same part of my brain that wants all my pens and pencils facing the same direction also wants my recipes organized “just so”. My binder is stuffed full of my favorite recipes. My mom typed in all of her family recipes and made an enormous book. She gave me the files and I slimmed it down to my favorites from her favorites and then added recipes I had accumulated on my own. They are all typed and formatted in Word, then organized by category. So it reads like a real cook book. So, basically, it is a lot of work to type up and format your own cookbook. I can’t say I recommend this method, but the finished result is just so lovely. Lovely until it becomes overflowing with new additions in the form of pieces of papers shoved haphazardly about. I’m now on my 4th edition since I’ve been married almost 10 years. 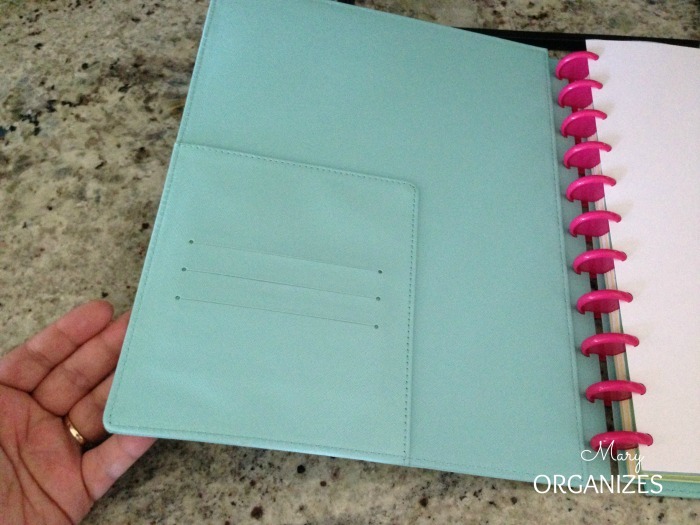 Organizing done well is self-maintaining. My recipe book is not self-maintaining. In the few years since my last update, my recipe binder had started to look pretty messy. Thanks to some amazing food bloggers, I am constantly finding new favorite recipes. I don’t really mean to go over two years in between upkeep, but other projects always feel more urgent. The Love Home Challenge was just what I needed to finally get this project put to the top of the priority queue. As Matt made time to help me create the Tables of Contents and print all the different sections (it is not straight-forward to print double-sided on my printer! ), I promised him I would make it up to him by cooking more often. Because while I was updating all the recipes, I was reminded that I have a lot of good recipes I’ve forgotten about! And that is pretty much what this whole challenge is about, to remind us all that we already have so much good in our homes, we just have to shine things up a bit to see! 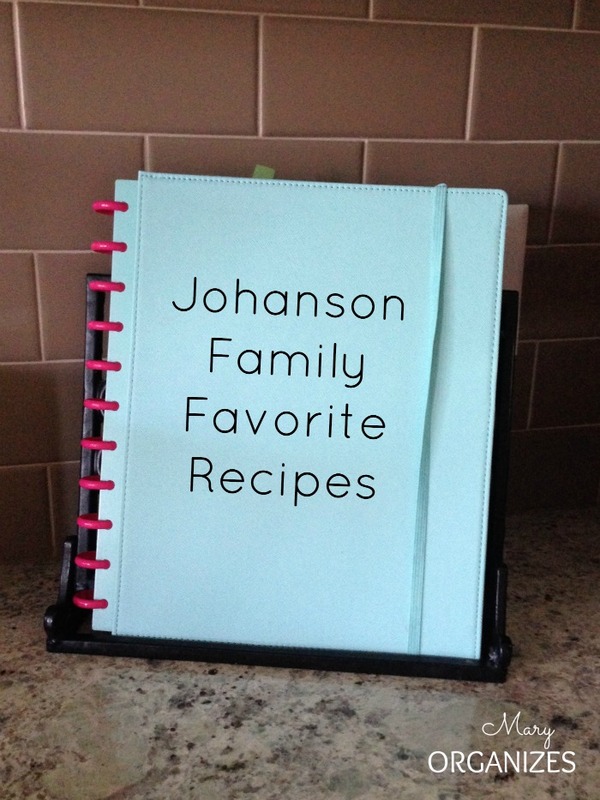 So, about the new and improved Edition 4 of Johanson Family Favorite Recipes: of course I made it discbound. It is my new addiction, after all. I used card stock with sticky file folder thingies to make the category separators. 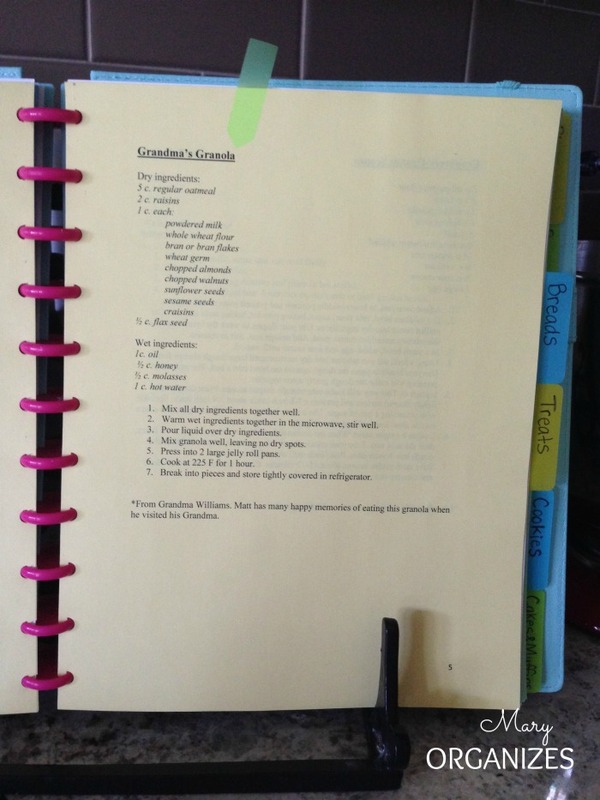 Tables of contents make scanning through my recipes so easy! I’ll use little sticky notes to mark our most frequently used recipes. Matt is a granola fanatic and we love his Grandma’s version. And then … as much as I don’t want to think about how my recipe book will be outdated the very next time I find a “keeper” recipe … I have this handy little pocket to stuff things. Normally this is the part of the post in which I’d ask you how you organize your recipes, but I’m not sure I want to know. lol. Chances are it is a lot easier than my way. I’m going to live in my state of denial. Wait, is it denial if you know you’re in denial? That is the deep question I’ll leave you with today. I have a binder for a committee that I chair that constantly has new pages and printed information added to it. I found that have a 3 ring binder hole puncher that fits IN my binder helps me keep it organized. I found it in the school supply section of one of the big box stores. Made my life so much easier. I have to admit. I tackled my recipe books the other week. I got 3 ring binders because people give me copies of their recipes and I print them from allrecipes.com and cut out magazine articles. I sorted them all out, put some/most into page protectors and put labels on the edges so I could easily sort into categories (much like yours). Mine’s not nearly as pretty but so far it’s working. I just punch holes in the new recipes and put into the category where it’s supposed to go. I didnt do an index to avoid upkeep, just call me lazy but so far this is working. Just not as pretty as yours! This is exactly what I do and it works very well. If I’ve only used the recipe once and haven’t use it ever since I remove the copy and look forward to new recipes. I forgot to mention that I keep a separate binder for desserts and other sweet stuff. Yes, I remove recipes that I haven’t made since the last edition. I really want the book to be a true representation of our favorites! Yours is self-maintaining, which means it is a better solution. I just can’t get past the aesthetics! My son was leaving home and going to be on his own for a couple years and asked me to give him some of our family favorite recipes. I found a website that lets you type in the ingredients and instructions for your recipe and it formats the information into a 4×6 recipe card. I formatted and printed out all my recipes and bought one of those cheap photo albums for 4×6 photos and put the recipes into it. This one had a 2 photo per page format. I decided while I was making one for him I’d make a 2nd one to have in case one of my other children wanted something like this in the future. Well, I started using that and now ALL my frequently used/favorite recipes go into that. It is small enough to fit into the cupboard where my ingredients for most cooking are and I use it all the time….and I love it. The best part is I don’t have any stains on my recipes and it is so handy! Just another bit of info. I saw on Pinterest small hand-written recipe cards framed, and in a collage type arrangement (like Mary’s wonderful pictures of her family), all her old and cherished recipes from her mother and grandmother. That, too, would be a fun/sentimental project as I have all my mother’s, mother-in-law’s and daughter’s recipes written in their own handwriting and all are now deceased. I hope to do this, too, someday. The recipe collage sounds like a beautiful tribute. Isn’t it amazing how food connects the generations? I am making many of the same recipes my great-grandmothers used and it really does help me feel close to them. I love your photo book recipe cards. Sounds awesome! I started mine last fall and did really well typing, printing, etc. for awhile but never finished it & of course have stuffed new ideas in the front pocket. So it’s a mess again. I do love the table of contents for each section, one of those duh moments. My husband actually did the table of contents for me. He figured out how to automatically generate them. I was so grateful, since it was one less thing on my list to do! And it makes such a difference! Mine is in a 3 ring binder that has a pretty folder I bought chopped and stuffed in the front and back pockets for some color. 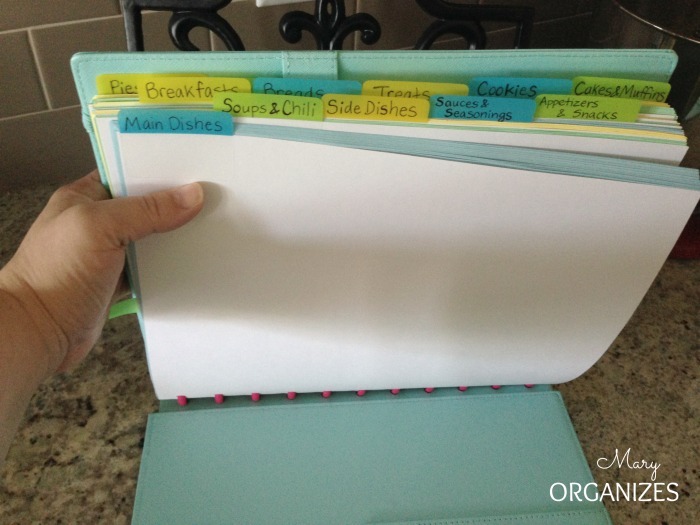 It has has a few dividers for different categories and every time I find a new recipe I like I just print it out/ make a copy and slide it in an empty protector sheet. I don’t mind that it’s not all uniform strangely enough. I think what I love most about it are the handwritten recipes from my Grandma and photocopied ones from my Great Grandma. It’s different….it has personality. And I love it! Most recipes have this formula “mix these ingredients- do this” then “combine these ingredients, add to the other ingredients” etc. After printing ONE SIDED only, cut each out, then place in old photo albums you can pick up cheap at garage sales or resale stores. This is an awesome system. I’m so glad you shared with us! I have two binders (one with meals-y recipes; the other with dessert-y and baking and all those “other” recipes). I have it all on my computer. One note to get more on a page: I put ingredients in two columns, so it doesn’t stretch way down the page (as in your example), so I can usually get TWO recipes on one regular size piece of paper. Plus…. 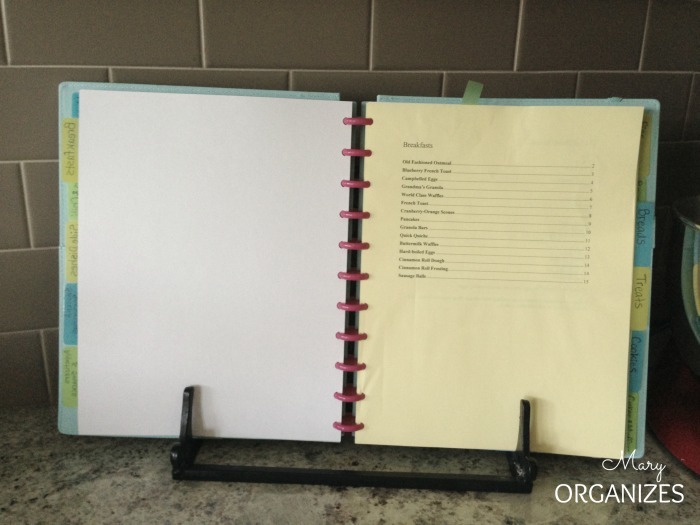 I print mine on ONE SIDE, and use the second side to print new recipes that fit in that section of the binder. I don’t keep a table of contents, because my sections aren’t that huge–well, some of ’em are bigger, but I enjoy paging through it, and it reminds me of the recipes I “do” have! So if I have a new Chicken recipe, I type it into my word document then print ONLY that page, and print it on the back of one of the recipes already in the binder. That is great! Thanks so much for sharing! I print and laminate my recipes. That way I can pull out what ever I want and even if it gets dirty, all I have to do is wipe them clean. I wanted to share that I use a clear plastic picture holder, one of the free-standing type, to hold a recipe when cooking. It’s up so I can see it well and the recipe is protected from splatters, etc. I store it with the binder when not is use. Off now to enjoy more of your site. . . I used to use a very similar method (although not quite as pretty), where I had binder tabs for sections and a combination of letter and index card sized plastic sleeves. I starters with one binder about 10 years ago, and quickly grew to two….one for savory, one for sweets and drinks. I had everything from clippings, to word documents, to website printouts, to hand-written scraps. Two years ago I decided to go digital. I started with an app called RecipeBook for $2.99. I liked it, but ended up upgrading to Paprika for $4.99 after about 6 months. Just like your binder approach, digitizing is a lot of work. I’m really bad about remembering to back up my phone and tablet data, and Paprika backs up my recipes with cloud storage so all my hard work and treasured recipes don’t get lost. I love that I can categorize the same recipe multiple ways (like entree, chicken, kid-friendly, etc) and can search by ingredient if I want to use something up. I can also pull up a recipe right in the grocery store if I see a good deal or great looking produce and pick up the remaining ingredients it make a dish. It took some time it get my favorites transferred, but for me it was totally worth it. It has some really cool time-saving features for the math-challenged like me such as a scaling to cut ingredients in half or double the recipe and a measurement converter which translates ounces of cups and so forth. I hung onto some of the hand-written family recipes. 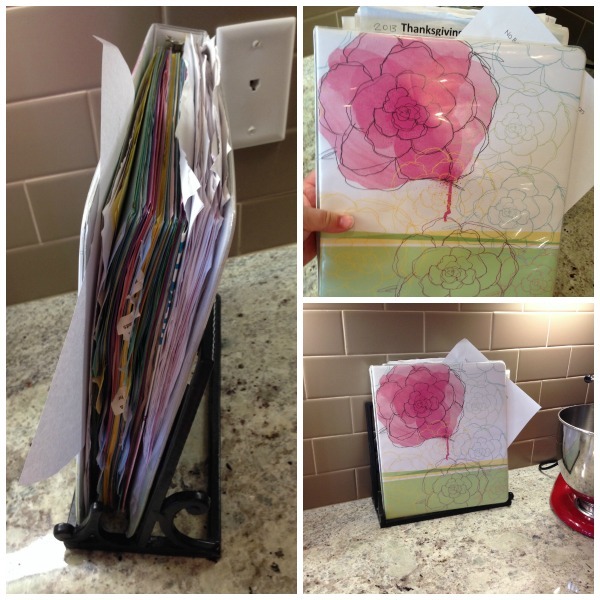 I love Debbie’s collage idea, and am definitely going to give that a try! 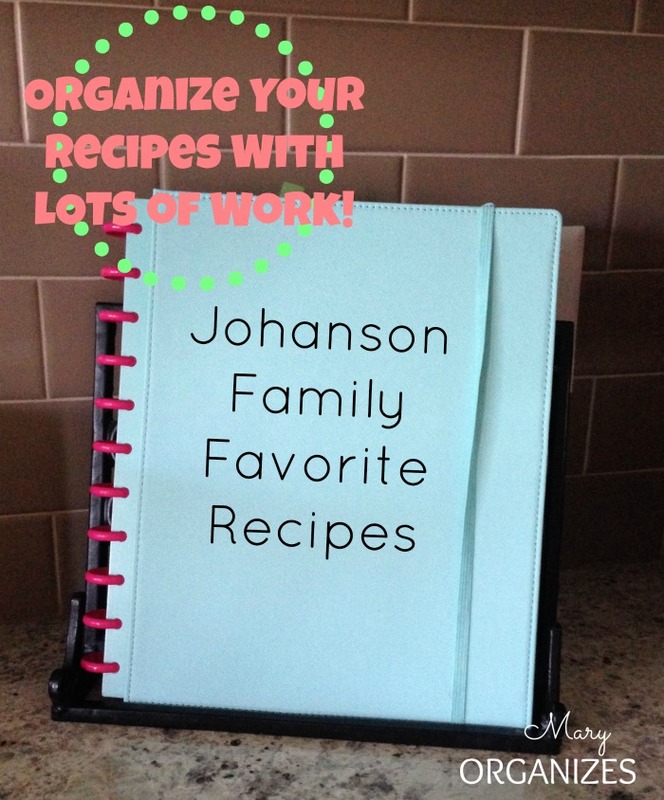 I love all the great ideas and tips on how to organize my recipes from the binders to going possibly digital. Thanks! Paprika changed my life! I’m not exaggerating. It’s so easy to download or cut and paste new recipes, edit recipes (because I’m always tweaking mine), email to a friend in seconds, menu plan, shopping list, categorize and search. No longer do I look at my pile of handwritten recipes and ideas torn from magazines and think “I’d like to try something with chicken in my slow cooker, but I’m not searching throught that pile. Oh well, same old!” I’m actually USING my recipes and finding new ones and COOKING finally, and feeling more successful in the kitchen than ever before in my life! I started my binder when my daughter got married. I typed them on the computer. Most were family recipes. When I printed them out, I used paper decorated with food, kitchen tools, or something related to the type of recipe. Ex. Potato casserole, I found potato stickers. At the bottom I told her where I got the recipe, or some story about it and our family. I have a few different books and binders with recipes from different people and I leave them separate so I know where to find them. But I also have binders for everything else. I print off a lot of recipes to try and then never seem to have time to try them. So I have a binder for ones to try and a binder for ones worth keeping after trying them. I also split the desserts into their own versions since I love baking and I get distracted trying to make meals. 😉 Eventually I’ll probably condense the books further, but it’s working for now. Finding something that works for you is what counts! Deserts would distract me too! Mine are saved on Dropbox in “Recipes” folder……I can pull them up anywhere, including grocery store to look for what I need for ingredients! I still have some that I need to add in though, I have been converting from paper to digital as I use them…..